...I had just finished the first of my blue Embossed Leaves socks. It took me a bit less than a week to finish the second one. Even with ripping back and shortening the toe on both socks about one pattern repeat. Have you seen some of these socks in this fabulous pattern around in the Sockapalooza circus? I particularily like the white version Peggy knit. Alison had even collected together some more links of Sockapalooza's Embossed Leave versions while I was still busy linking to hers. Ah, the internet. Too fast for me. 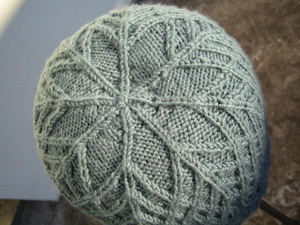 I substituted the yarn called for with Debbie Bliss' Baby Cashmerino (colour 203). Since I was way off the row gauge, I had to break into another skein. Consequently, the plan is to add a pair of ankle socks matching the hat. They are just not completed yet, nothing to show. ...I will be off spending a week in continental Europe! In France, to be precise. Another thing to look forward to. 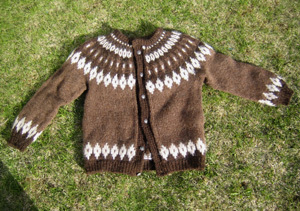 ...I finished this Lopi cardigan. Brace yourself for appropriate and necessary exclamations of outrage: Even though everything was handpicked by the recipient (pattern, colour combination, even the buttons) he didn't even bother to TRY IT ON once. Since completion the cardi resides now in the coatrack for three weeks. I should have known that something like this happens. Oh, well... I'm proud of it anyway. I'm not often knitting b i g.
...we are going to have a new family member. After the first alarming incident and my untimely farewell to Willy, he left for real! 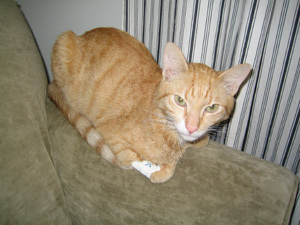 He's been missing now for a months and we are about to abandoning hope that he might come home again*. We miss him so very much. Though we cannot replace him, we decided to carry on with sharing our house with a feline. So, after the holidays the time is ripe. I am already checking out the page of the local cat shelter on a daily base. Firstly, to check of course if somebody registers Willy and now, secondly, to find "our" new cat. Okay, enough jumping around in time. Looking at the result, I feel kind of optimistic and that's definitely a good thing these days. *Poor Willy was still suffering from his involuntary diet and was so weak that the vet had to force-feed him with via transfusion! Three pictures of finished objects justify just another shot of Willy, don't you think? 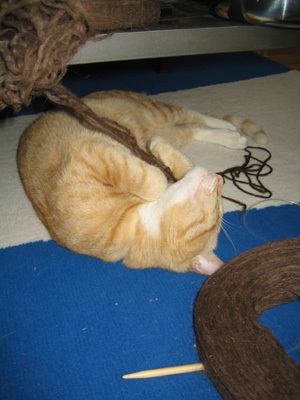 Here he is not playing with my plötulopi yarn - no! He just grabbed the hanging strands and hugged them in his sleep. Oh, so cute! by Carola at 7:14 e.h.
Oh, Willy! He is so sweet with the fleece! Embossed Leaves was one of the most enjoyable patterns I've ever made! Making another pair is on my long long list of socks to make. Yours are beautiful - I love the blue! maí 27, 2007 1:07 f.h. Your socks are beautiful! 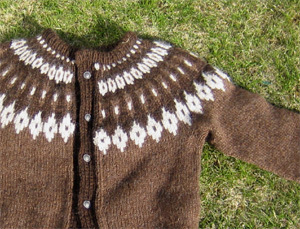 The cardigan is gorgeous too. I love the brown, it is like chocolate. maí 27, 2007 1:55 f.h. Oh that's too bad about Willy. I can't believe that the sweater was never tried on or anything. I would be pretty upset about that. You finished a whole sweater, wow! Beautiful hat and socks too. The Embossed Socks are gorgeous. What yarn did you use? maí 27, 2007 5:15 f.h. I love the lopi cardigan. Very nice colors that the lazy recipient chose! maí 27, 2007 8:42 f.h. So sorry to hear about Willy! Hopefully someone picks him up and takes him to the cat shelter. The socks are gorgeous, they make me want to knit some, too! maí 27, 2007 11:01 f.h. maí 29, 2007 3:46 e.h.
Oh, poor Willy, I hope he's at the good place, whereever that is. Those socks are lovely, the solid yarn really shows off the pattern beautifully. maí 29, 2007 6:48 e.h.
maí 30, 2007 3:41 f.h. I'm sorry to hear about Willy. I would be devastated if only of my kitties went missing. You knitting is gorgeous! Those embossed leaves socks make me want to drop everything and knit a pair this instant. maí 30, 2007 2:37 e.h. I love the format of this post - quite clever! Your socks, hat, and sweater (even if unworn) are lovely. Have a fabulous time in France. And I hope Willy is well, wherever he may be. júní 01, 2007 11:45 e.h.
Oh, poor Willy! He will be missed. I'm glad you're open to getting a new kitty friend. You've got so much yarn and love to share with it! I quite like the brown sweater. It's lovely, but it's reactions like that which make me not knit for anyone other than myself. júní 06, 2007 6:36 e.h.
Oh, I'm sorry about your cat, Willy. He looks like he was very sweet. The sweater is gorgeous. I'm glad you found my blog, and I found yours now, too! Enjoy your vacation. júní 16, 2007 2:09 f.h.